The last of the sixty-two townships to be organized in Otter Tail county was Dead Lake, which, for many years prior to its establishment as a civil township on March 24, 1897, had been attached to Perham for all township purposes. On the above date Henry Eaton and twenty-five other legal voters living in congressional township 135, range 40, petitioned the commissioners for the organization of the said territory as a civil township to be known as Dead Lake. The first election was held on the 10th of the following month at the school house in district No.239 in section 16. The petition bore the signatures of the following voters: Henry Eaton, James L. Richards, T. J. Elwess, N. J. Batton, T. A., Sampher, J. L. Bullock, J. D. Hitz, Parker Smith, George Bugbee, Calvin Comstock, Benjamin Thereault J. B. Batton, James L. Keith, H. Helms, J. H. Fairchild, P. L. Bundy, Ansel Eaton, C. O. Simmons, C. S. Burnett, A. H. Helms, V. H. Miller, L. W. Hites, G. P. Eaton, A. S. Roberts, Amos McIntyre and L. W. Eaton. 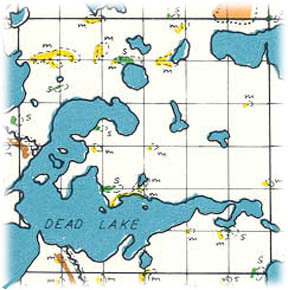 Dead Lake township has two large lakes, Dead and Marion. Dead lake spreads out all over the southwestern part of the township and stretches across the township from east to west. It covers at least seven sections of land. This township is the most thinly settled of any in the county, but within the past few years a great improvement has been made in the general appearance of conditions in the township. The only platted site in the township is known as Yaquina Bay, which is located in section 8 on the extreme northern shore of Dead lake. It was platted in the fall of 1910 and recorded in the office of the register of deeds on November 23rd of that year. The proprietors were S. M. and Carrie Suffron. Although this township has not had a postoffice for some yeasr, there was once a representative of "Uncle Sam" stationed at a place called Redington, at least such a place is listed in old postal guides. There is not a church, not a mill of any kind and no villages to distract the attention of the wayfarer as he journeys through this township. Places of birth for Dead Lake Township in the 1905 state census.